In honor of Halloween, I am reprinting this post from October 27, 2006, which was inspired by a visit to The Mount, the Berkshires home of Edith Wharton. During the visit, we were treated to a live reading of her suspenseful tale, "Kerfol," published by Scribners in 1916. Read on for more on this scary tale, and be prepared to leave your lights on for a while after you're done! We recently visited Edith Wharton's home for ten years, The Mount, in Lenox, MA. The place was fascinating, and we went on a tour of all the rooms as we heard about her colorful yet difficult life -- her estrangement from her husband which ultimately led to her divorce; her move to Paris as a result of the loss of her social status; her unique decorating ideas, which were incredibly innovative for the times; her extensive publications; her close friendship with Henry James; and the personal bravery she showed throughout her life. What does all this have to do with Halloween? Well, at the end of our tour, we were treated to a live reading of a short story Wharton published in 1916 with Scribner's magazine, called "Kerfol." Complete with howling dogs, haunted house, a trial, a gruesome murder, a creepy husband, and other juicy tidbits, this was by far the scariest ghost story I have ever heard in my life. It's right up there with Edgar Allen Poe's "The Tell Tale Heart." If you really want to sit down to a scary read for Halloween, get hold of this short story and read it in one sitting...but make sure you're not home alone. Here's a taste of the story: "The very year after the little brown dog was brought to Kerfol, Yves de Cornault, one winter night, was found dead at the head of a narrow flight of stairs leading down from his wife's rooms to a door opening on the court. It was his wife who found him and gave the alarm, so distracted, poor wretch, with fear and horror -- for his blood was all over her -- that at first the roused household could not make out what she was saying, and thought she had gone suddenly mad. But there, sure enough, at the top of the stairs lay her husband, stone dead, and head foremost, the blood from his wounds dripping down to the steps below him. He had been dreadfully scratched and gashed about the face and throat, as if with a dull weapon; and one of his legs had a deep tear in it which had cut an artery, and probably caused his death. But how did he come there, and who had murdered him?" "If we'd stop trying to be happy we could have a pretty good time." 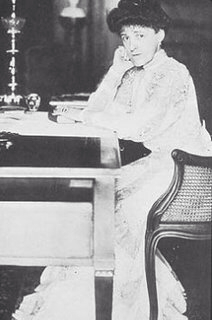 Are you an Edith Wharton fan? What is your scariest literary read? Feel free to comment!